Comics and comic books have been around for a long, long time in American history. The first credited comic, which was a newspaper comic strip, was Hogan’s Alley by Richard F. Outcault. First appearing in Joseph Pulitzer’s magazine New York World and later in William Randolph Hearst’s New York Journal, the strip followed the story of The Yellow Kid, a young bald boy named Mickey Dugan who wore an oversized yellow nightshirt. Hogan’s Alley was filled with odd characters like Mickey, who were also mostly children. It was also the “one small leap” to what would be a mass media form, recognizable all over the country, and later the world. Regarded as America’s “first superhero”, Superman (created by Jerry Siegel and Joe Shuster) debuted in Action Comics #1 on April 18, 1938 (cover-dated June). The story of an alien baby that was sent to our world by his parents moments before his own was destroyed, that grew to be the protector of our planet and the enforcer of “truth, justice, and the American way” in the United States, became an icon to generations upon generations of people and popular culture. Superman is the primary inspiration for the idea of “Super Heroism” and more than likely the inspiration to every comic book character since his inception. But it’s not just the cool powers or costumes that make comic books great; it’s how they mirror our own lives and situations, be they somewhat fantastical, that make them so appealing to us. Comic books and the characters and adventures they bring to life have been a part of the childhood of many young men and some women since the 40’s, 50’s, and so forth. They were something many young boys went to the corner pharmacy or general store and picked up for 10 cents or so, because they allow them to immerse themselves in worlds where literally anything is possible. Comics also allowed people to see how these characters would react to the situations they themselves were presented with every day, like war, unemployment, family, and life in general. Some notable examples are Superman, Batman, Wonder Woman, Captain America, Spider-Man, and the Fantastic Four. These characters are regarded as possibly the most “human” characters in comics, due to how their trials and tribulations mirror the everyday situations of the common man (though Superman and Batman are a bit more…extravagant). Captain America was a one of the chief examples of characters appealing to the masses. Debuting in Captain America Comics #1, he was the epitome of the American male typecasting. A man who only wanted to serve his country, and would go to any lengths to do it. The cover of his debut comic featured Cap punching Adolf Hitler in the jaw, and was such a hit among the masses that it sold over a million copies. 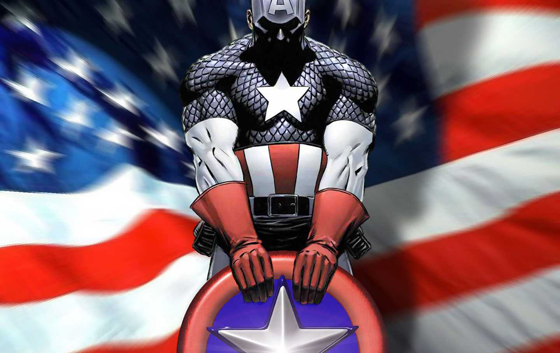 Captain America was the character that every young boy aspired to be. He was also used by government officials to encourage to buying of war bonds, working scrap yards, and other things to help encourage people of the country to do whatever they could to support the war effort. Captain America showed that comics could deal with real world issues in a more, no pun intended, comical way. This resonated with a lot of people in the 40’s, but when the war ended, his popularity waned and wasn’t seen again until 1964. In 1964, it was revealed that Captain America had been frozen in a state of suspended animation, and was resurrected by the superhero team, The Avengers. This time around, he was still portrayed as a man of honor and military, but left to try and fit in a world that didn’t really agree with his ideals anymore. He was a man lost in time, out of touch with the world around him. As this was the 1960s, this was an even bigger example of times, with freedom movements, Woodstock, protests on the rise, and anti-militarism at an all-time high. There were many young men and women out there who didn’t agree with what was going on in the world, or were on journeys of self-discovery and reevaluation. Marvel Comics is one of the more prominent publishers to feature more family-type stories for their comics, most notably the Fantastic Four, Spider-Man, and the X-Men. These characters had strong ties to the other people in their stories, with the FF being an actual family, and Spider-Man’s whole philosophy being based on his not being able to save his Uncle Ben and the strong influence of his Aunt May in his life, basically being the mother he never had. These comics show how characters must balance both their superhero life with the life they leave at home, and what can happen when those lives intertwine. They showed what can happen when you spend all your time going out in tights, but don’t get home in time to get your homework done. Or what happens when your most hated archenemy learns your secret identity. This is especially prominent in Amazing Spider-Man #121 (June 1973) when Peter Parker’s (now) most hated enemy, the Green Goblin (Norman Osborn) uncovers Spider-Man’s identity and proceeds to kill the woman that Peter loves, Gwen Stacy. The impact of this story is massive, as there has never been a superhero who has failed so badly. Loved ones in comics, other than in origin stories, had never died so suddenly, or so violently, without any previous foreshadowing by the writer. Gwen had been dropped off the George Washington Bridge, and Spider-Man used his webbing to grab ahold of Gwen’s leg. When Peter finally got to Gwen however, she was already dead from a broken neck. It was later confirmed that it was the sudden snapback of the webbing that snapped Stacy’s neck, and that it was Spider-Man’s error that caused her death, not the Goblin. This kind of writing shows what happens when one doesn’t take the necessary precautions, and Peter’s difficulty handling the death was one of the hardest in the history of comics. It showed us that even “super” heroes have human emotions, and that they are as frail as everyone else. Hope you enjoyed my latest piece, and stay tuned for Part 3, COMING SOON! Well done. My husband is a lifelong reader and he was the one who introduced me to comics. While I've come across some great stories, it always seems to be the artwork that makes the magic happen for me. Thanks for a great piece. Looking forward to the next one!